Go to @Sources-> @â€Your source – Editâ€->@â€Categories change +marginâ€ and Press @Donwload template. 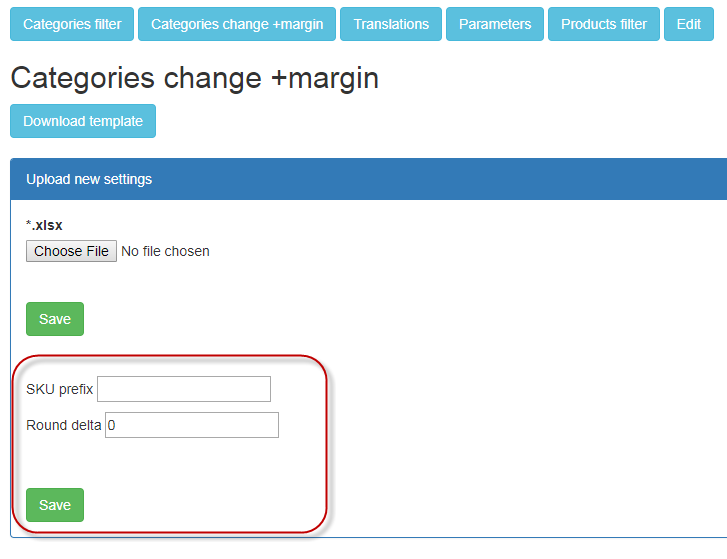 Template for Settings Margins for selected categories will be downloaded. Now you have to fill this file and upload to @â€œUpload new Settingsâ€ section. â€œSource categoryâ€ column (A) – do not change it! â€œDestination categoryâ€ column (B) – allows you to change original category path. Pretty prices like 4.99 or 0.95. How to do it? Go to @Source settings and at @â€Categories change + margin settingsâ€ section set @â€Round deltaâ€ value: 0.05 or 0.01. 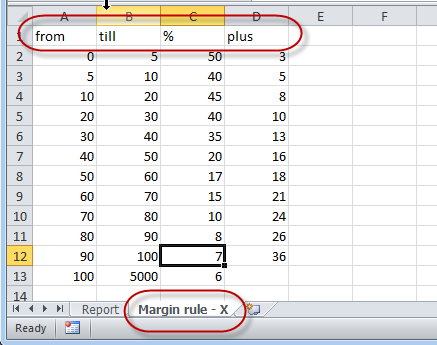 How to apply margin based on Wholesale price range?